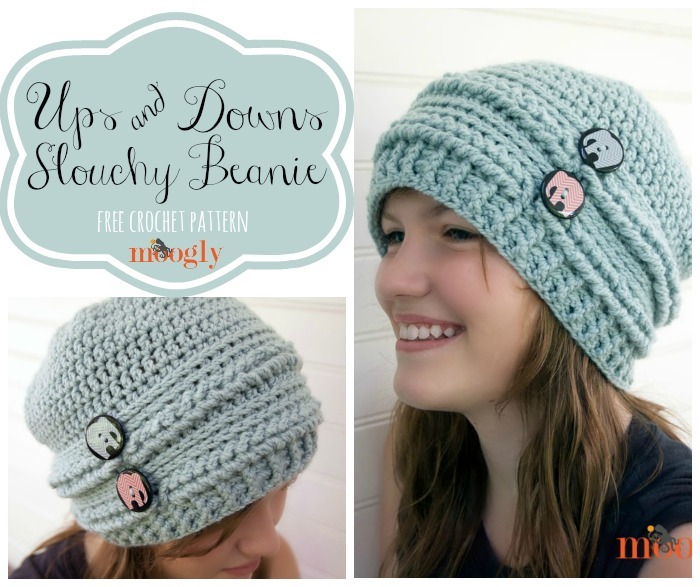 Ups and Downs Slouchy Beanie: FREE #Crochet Pattern! Don’t worry – the Ups and Downs Crochet Slouchy Beanie won’t mess with your emotions! 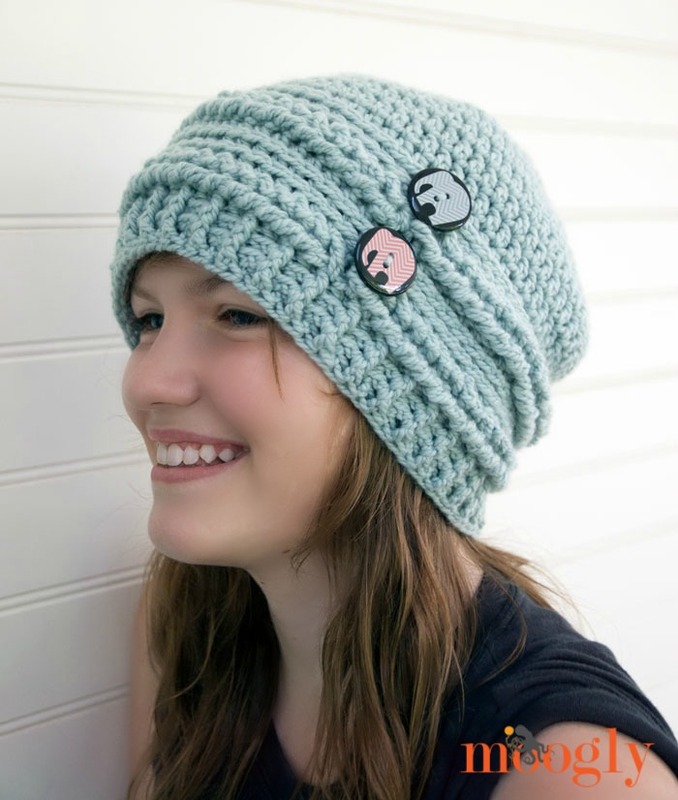 But it will put a big smile on your face when big tall stitches twist down into fabulousness and bring this slouchy beanie to a whole ‘nother level! 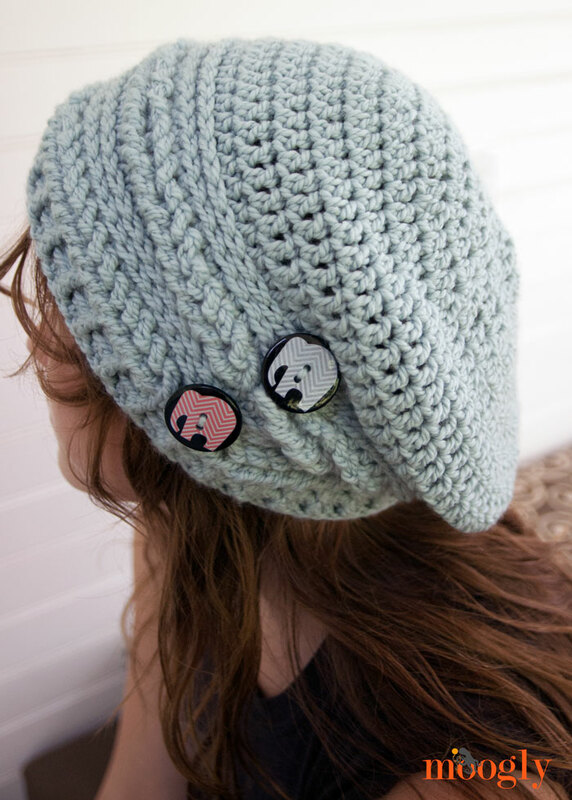 The Ups and Downs Crochet Slouchy Beanie uses 4 different crochet stitches and 2 cute buttons to create a unique free crochet pattern. 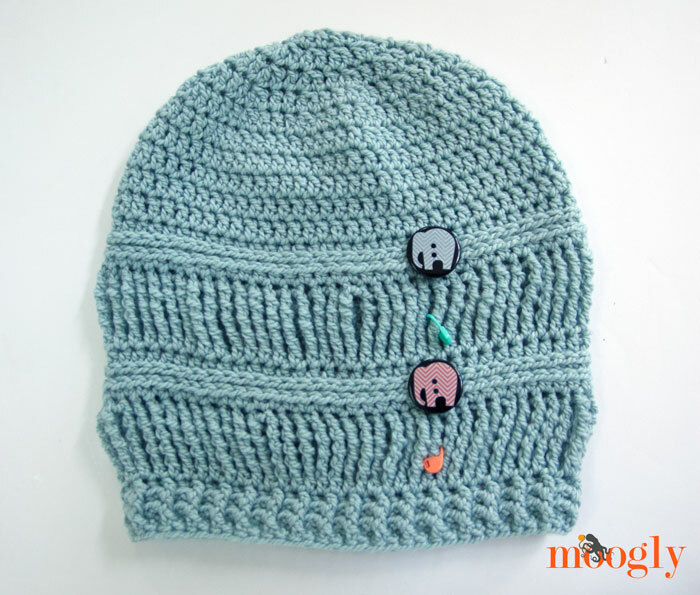 And it’s easy to customize too – add more (or subtract a few) rows to make it slouchier or beanier- it’s up to you. Undo a braid to change up the length and look on the fly – this hat goes wherever you want to take it! It includes 3 sizes, but is shown here in the largest – a nice easy fit for an adult. A bit tighter on my noggin, soft and loose on my 12 year old. I’d share pictures of it on me, but I’m still working on those 10 foot long arms. And odds are she’ll be stealing it anyway! Cliquez ICI pour la traduction Française! Click on the highlighted stitches and instructions for video tutorials! Round 1: FDC 54(60,66), join with sl st to first FDC to work in the round. Round 8 – 11: Repeat Rounds 4 – 7. Round 12 – 14: Ch 2 (does not count as a st), dc in each st around; join with a sl st in the top of the first dc. (54(60,66) sts) NOTE: This is where you add or subtract rows to make more/less slouchiness. Round 19: Repeat Round 18. (6 sts) Break yarn, gather top if needed, and weave in ends. Go to assembly instructions below. Round 20: Repeat Round 19. (6 sts) Break yarn, gather top if needed, and weave in ends. Go to assembly instructions below. Round 21: Repeat Round 20. (6 sts) Break yarn, gather top if needed, and weave in ends. Go to assembly instructions below. 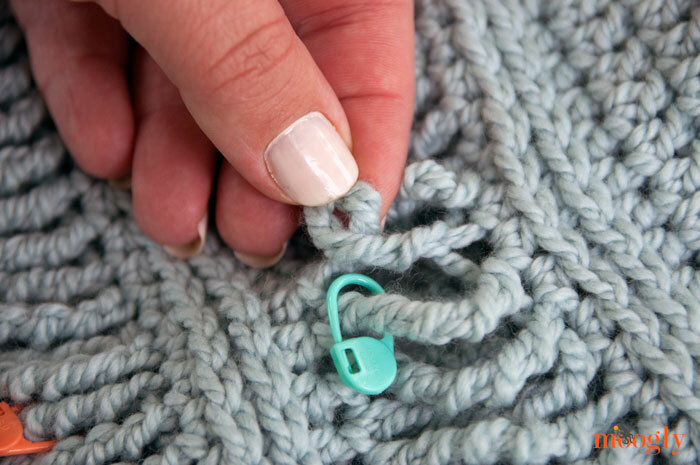 The QuadTr sts from Rounds 4 and 8 will be used to make “braids.” Use the stitch markers to mark where you want the braids to end as they go around the hat – the buttons go right above the marked stitches. Placement here is a personal choice! Sew the buttons to the hdc rows above the marked stitches. 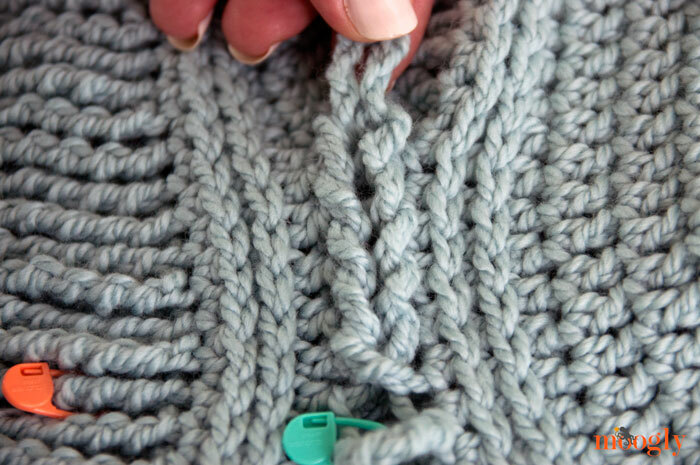 Pull the next QuadTr through this loop, without twisting this second stitch. Continue pulling each Quad Tr through the previous loop, not twisting them. Use your fingers to close the center of the braid so that the “ladder” doesn’t show in the center. When you get to the marked stitch, remove marker and pull through loop to finish braid. Loop this last loop over the button above, to hold the braid in place. Repeat steps 3 and 4 with next row of QuadTr. And voila! The Ups and Downs Crochet Slouchy Beanie has shrunk several inches, and those crazy tall QuadTr stitches have turned into fun braids that go all the way around the hat. You could add another repeat of Round 4-7 for a third row of braids, or go right to plain dc sts for Rounds 8-11 if you want just one braid and button! The details are all up to you. I can’t wait to see all the fun projects you make using this pattern! I have been looking for a pattern for my granddaughter. This will be right up her girly girl alley. Thank you! 😀 Thank you Irma, I hope she likes it – and that you enjoy making it! You are an amazing designer! Thank You for all your time and creativity! This will be my next attempt at new stitches. I can hear my husband now, another new hat? Thanks again. 😀 Thank you so much Arlene! Do you make them? I would like to buy one or two! Hi Tamara I just love your patterns, they are just wonderful 🙂 Thank you so much for sharing. 😀 Thank you so much Dianne! Hi Caitlin! I purchased them within the last month. 🙂 Thank you! I just got a new hank of yarn and THIS is the pattern!!! Thanks so much! I just loved hats with texture and this has so much. I can’t WAIT to try it. Thank you so much for publishing it. After I make my first one, I’ll stop back and let you know. Oh, and I love the button feature – just one more element of interest. Thank you for posting the size of the button. 😀 Thank you Juli, I’m so glad you like it! This is so cute!! I am making one now but I am having problems with the hdc in back 3rd loop. I am not sure if I am placing them in the right place. Can you post a video or picture of the right location got this stitch. Thanks so much. Hi Opal! I’ll be putting up a video for that technique this week! I’m almost finished with this hat! Just have to wait till morning to raid my mom’s stash of buttons to find the perfect ones. It worked up really fast and was super easy. Thanks so much for making your patterns so easy to follow! 😀 Thank you so much Tracy, I’m so glad to hear you liked it! Thank you Kristen! It depends on how big her head is, and how tight she likes her hats – and how tight your own gauge is. The Large is the one pictured here. Could you elaborate on Rnds 6-7?? Not sure where the 3rd loop is?? Love the new stitches tho, such a great pattern! Thanks for sharing! Hi Amy! I’ll be posting a video for that technique this week! Let me just say, this was so easy to make its insane!!! It looks super intricate and like it would take forever to make the fishtail center, uh, nope! I love this pattern!!! 😀 Thank you Tori! That put a big smile on my face this morning! I love the pattern. But i need some help. My rows 6-7 do not lay right. I have redone the rows 4 or 5 times, and i cannot get it to look right. Can you help? Hi Diana! I’ll be posting a video of that technique this week! 😀 Thank you Andrea, I’m so glad you enjoyed making it! Great tip on the hook! Here I am again. Is it the same as the bpds? I looked closely to the picture and that is what I see? There are bpdc and fpdc used in the brim, I’m not sure what a bpds is? Love this pattern Tamara!! My youngest granddaughter just started her freshman year of college, in Syracuse NY and she has asked for lots of “Nana hats” to keep her head warm this winter and guess which is going to be first on the hook?? 🙂 yep, this one!!! Thanks for all your inspirational patterns and wonderful tutorials!!! Hugs! 😀 Thank you so much Anita! Hi Tamara, I’m spanish and I don’t understand at round 6, “hdc in the 3rd loop (in back, behind the top two loops)”. Can you explain me, please? Thank you so much! Ok, the PrintFriendly button has a picture of three people instead of the normal green leaf I’m used to seeing. Thanks! How strange! It’s still a leaf for me – maybe that was a weird temporary thing? Or I have a cached version? It’s an external plugin (calls up another website to interact with mine) and I don’t really have any control over it other than including the button. Hi, so I have a question. I am currently stuck on rows 6-7, but I don’t understand what it means by going in the back loops 3 down? Is it possible to email me and sort of explain it? Hi Samantha! I’ll have a video for that up this week! I am having problems with rounds 6 & 7. Do you gave a video tutorial on this round? Or even a picture pointing out the 3rd loop I should be using? Thank you. I’m sorry, somehow I missed your reply to others asking the same question. I love this pattern and am intrigued on the new stitches for me to learn. Thanks again. 😀 Thank you Lisa! I should have it up on Wednesday, baring unforeseen technical difficulties (pretty sure that’s the online version of knocking on wood lol). 😀 That’s when you know it’s a winner! Thanks so much Cazzie! 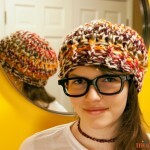 My daughter has asked me to make this hat for her and she wants a pair of fingerless gloves to go with it. Any ideas on a pattern that might compliment the hat? Hello! I love this hat and would love to try to give it a try this weekend. However, I usually crochet from the top of the hat, down. Would this work if I made the pattern backwards (Started with the last round and increased instead of dec.). I’ve never done this before, so I’m not sure if it will work. Yes, I think it would work great! 🙂 Just increase instead of decrease for those first few rows! Thanks for this adorable idea! I just made one for my daughter who loves slouchy beanies and just started college last week. I wanted an idea for a beanie in her new school colors, something different. I wish I could figure out how to include a picture here. I modified the pattern slightly, using only one row of the quad treble stitches, so only one braid. I did that row in a contrasting color, so the hat is black and the braid is gold. I’m already dreaming of ways to incorporate the cool braid idea into other hats and scarves. 😀 Thanks Jean! Black and Gold eh… Hawkeyes by chance? Nah, Tyler Apaches. 🙂 I’m working on one now for a friend at Texas Women’s. Maroon with white braids. I have in mind a matching scarf that uses white braids across each end. Thank you for such a fabulous pattern! 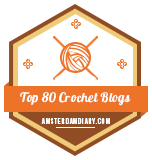 It was a great challenge, and those quad triple stitches! Keeping the right amount of tension was a new lesson in patience! LOL but I love the pattern and even made the fingerless mitts to go with it! I love the pattern. I love the detail and videos you added. They helped a lot. I learned so many new stitches! Thank you! I’ll be making more of your patterns! Now on to the mitts! 😀 Thank you so much Zee! Loved this pattern! Thank you! I made one for my granddaughter and got SO many compliments! Can’t wait to make the fingerless gloves to go with it! 😀 Thanks so much Joan I’m so glad to hear it! Hi, I love the hat! I had a question, is there any yarns that you have used or recommend using that cost a bit less? the one listed is $20 a skein and I cannot really swing that. Thanks! Hi Adeline! Any medium weight (worsted or aran) should work just fine. 🙂 Just look for the yarn symbol “4” on the label! This is adorable! I’m gonna make one 🙂 Tamara , may I ask you – which rounds would you subtract to make this a beanie, rather than a slouchy hat? Please ignore my question, Tamara – I was so excited, I just jumped right in 🙂 I just finished this in a beanie hat – I skipped rows 12-14 all together. Came out perfectly! I did mine in Red Heart Boutique, Unforgettable – Echo. I wasn’t sure how the variegated yarn was going to look, but I love it! Such a fun pattern, Tamara, Thank you! 😀 Yay! Thanks Penny! I’m so glad you like it! But love love love the pattern!! 😀 Thanks so much Isabel! I did actually consider stopping there, but I was having too much fun! 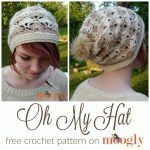 I saw this hat and my mouth hung down….I love crocheting hats and this one was so different from all the other ones I have made. I just got it finished with cute cat buttons in a charcoal grey color!! Everybody loves it!! I will be making many more in all different colors. Thanks so much for this and all your wonderful patterns 🙂 !! 😀 Thank you so much Julie!! I’m so glad you like it! Ooo, I haven’t gotten a chance to play with that one yet, bet it’s great! 😀 Thanks Mindy! 😀 You’re very welcome, I’m so glad you like it Theresa! Thank you! I’m from France and I would like more information about the yarn. On the website (http://www.purlsoho.com/purl/products/item/9239-Purl-Soho-Worsted-Twist), the needles suggested are 7-8. But you used a 5.5 hook. Do I have to look for a 7-8 yarn or a 5.5 yarn ? I’ve been on Ravelry and I understood that recommended needle size 7-8 is for US range and not european. 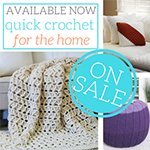 Thank you for those patterns, i’m going to take my yarn and crochet all these as soon as possible ! I’ve been searching everywhere for the perfect winter hat and I have FINALLY found it!! I am so so excited to make this. Thankyou for the great tips and for the free pattern. It is so appreciated! 😀 Thank you so much Allison! 😀 You’re very welcome – thank you! Just finished this for my friend and oh my gosh is it cute!! I crocheted some little flowers in place of the buttons and it’s just darling. I will have to make one for myself! Awesome design! 😀 Thank you Holly, I’m so glad you like it! I’m on row 6, and it looks so fat! Am I doing something wrong? It should be a bit smaller around than the head size you’re making it for. Did you get gauge? 😀 Thank you so much Sarah! I’m so glad you found “me”! I love the ups and downs set. Is there any chance you will have a cowl or scarf to match them prior to the holiday season? If not, would you mind if I improvised one? YEA!! I can’t wait, thank you!! Is a matching scarf for the Ups and Downs hat coming out today? Loved making the hat. I learned some new stitches and procedures for getting a new look. thank you very much for this nice pattern. I learned some new stitches by your wonderful tutorials. I made this beanie for my dear colleague, a real pink lady. Because we couldn’t find any nice buttons, I fixed the bordure with crochet flowers. It looks so nice. 🙂 Thank you Wiebke! I’m so glad you liked making it! I’m having trouble understanding the braid. Can you explain that a little more? 😀 Glad it gave you a good start! Thanks Rachel! I would like to make a suggestion on your printed patterns. If you could include a brief description of how to do special stitches at the top of your patterns that would be very helpful. I printed up one of your patterns and got stuck on the first row because I didn’t know what the abbreviation meant and didn’t have an internet connection. Just something to consider. Your patterns are absolutely amazing in every other way. And I thank you for making them available. Thank you Maribel! It’s a hard balance, as people also request them to be more abbreviated. I love this pattern. I made the QuadTr in dark pink, and I love how it turned out. Thank you so much for sharing it. Thank you so much, I’m very glad to hear it! Wow, thank you so much Angel!! I really appreciate you saying so! <3 Happy New Year! Best hat pattern ever. I’ve been looking for a hat to make for myself for years. This is perfect. Thank you Tamara, it’s beautiful. Thank you so much Edel! I’m so glad to hear it! HAPPY NEW YEAR! Thank you so much for all your beautiful patterns and your helpful ideas! You are a sweetie to do this for us! I’m new to crochet and you are definitely making it exciting for me!! 😀 Thank you so much Ginghun! I have made the fingerless gloves and love them! I am trying this pattern for the matching hat, but wanted to do just one round of braids and no slouch. But when I omit the rounds that you mention, it is too short. How might I add length without adding slouch? Thanks you for these patterns! Love the braids. I have made the fingerless gloves and love them, now I’m working on this hat. I want to do it with just one braid and no slouch. I have omitted the rows that you suggested but it is too short. How might I add length without adding slouch? I’m sorry if this is a duplicate, I didn’t mark the email update on my first one and then couldn’t find it in the list. 😀 Thank you so much Teri! Made two already love the pattern ..thank you for sharing. Absolutely love the hat. So easy to make and yet it looks so intricate. Really loved the easy links to the tutorials on how to do each stitch. I’ve only been crotcheting for 12 months so I still need to check what I’m supposed to do for each stitch. I’m looking forward to making another one and to checking out your other patterns. Thank you Thao! I’m so glad you liked it! I always enjoy your patterns and I’m excited to finally have a chance to work on this one. I am running into a bit of a snafu with the tall stitches though. By the time I finish the fifth and sixth ‘yarn over, pull through two” combos, the loops are very loose! It’s causing the hat to fan out on row 4. Is this typical? Should I switch to a size smaller hook for the rows with tall stitches? Or do you have any tips to avoid the loose loops at the end? Any help will be much appreciated! Hi Noemi! Thank you! 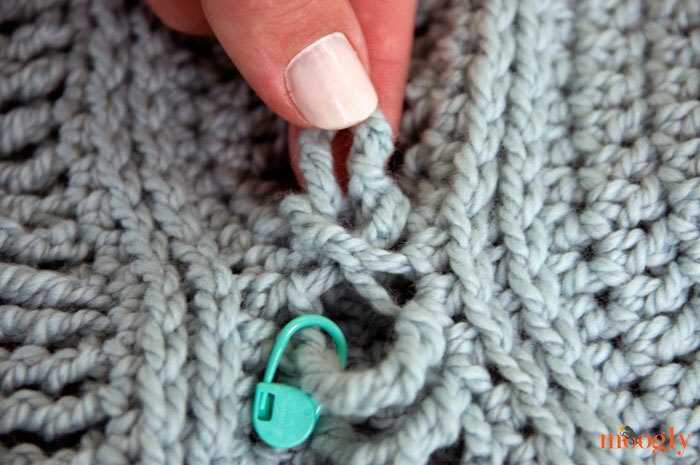 To keep the tall stitches tight, it’s important to do the yarn overs close to the hook, and then use your non-hook hand to pinch the pairs of loops as the are worked off the hook. Then, if it’s still a bit uneven, you can actually even them out by pulling a bit on the loops that wrap around the stitch on the right (if you’re right handed), working down the stitch, to even it out. Does that make sense? I liked the pattern and want to make it myself. But I could not understand *** 54(60,66). This was so fun to do! I learned a lot of things while using this pattern. Like third loops, and QuadTr, and decreasing in DC! And then the super fun braids at the end were awesome! Thank you so much for the pattern, please have a wonderful day! 😀 Thank you so much Kee! I appreciate it!! Love, love, love the pattern. Made it for sale on my Etsy site. Credited you and put a link (but Etsy does not allow active links, so people will have to cut and paste. Please take a look and tell me what you think. Everyone who has seen it so far loves it. Thanks so much for sharing your talent. I want to make the 3rd row of braids…but don’t want it to be too “slouchy”. Any suggestions? I am absolutely in love with the Ups and Downs patterns, but am having difficulty on the finishing of the braids on the entire Ups and Down set… help, please! Hi Autumn! Did you watch the video tutorial? I adore this hat so much! I’m already working on my second and planning on buying more wool with the view of making the full set that I didn’t realise was there until after my wool purchase! 😀 thank you Tamara for bringing this pattern to the world! 😀 Thank you so much Samantha! Weird question–I’m planning to sell this at a craft sale. I noticed from your info that you’re cool with the finished products being sold, as long as we “link to the pattern”. 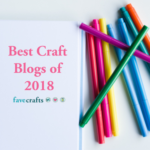 Do I literally write out the link address, or can I just put “Pattern credit is the Ups & Downs Slouchy Crochet Beanie from the Moogly Blog, by Tamara Kelly” or something along that phrasing? I’d just feel kinda silly hand-writing all the dashes and slashes and whatnot. But if that’s how you’d prefer to be credited, I’ll do it! Awesome hat, by the way. I just finished it in Vanna’s Choice and it’s so squishy and comfy and cute! Thank you so much Abby! “Pattern from Moogly” would be wonderful! 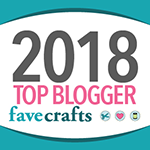 Best of luck with your craft sale! Loved making this hat! I made it for my daughter-in-law and she adored it. I was almost afraid to try the pattern, but it turned out easier than I thought and I intend to make another one. Used Red Heart With Love – White. That’s fantastic Karol, thank you! I’m so glad to hear it! Hi there, in round 5 it says to chain 1, then HDC in each st around. I clicked on the tutorial for hdc and after chaining once, you turned your work and started the HDCs then. The HDC tutorial was not specific to this pattern, so I’m confused about the turning. You didn’t say to turn after chaining 1 in these instructions, but I’m wondering if that’s just a rule with HDC that most people who crochet know. I’m pretty new at crocheting, and up until now have only done granny squares, so I don’t yet know all the rules of each stitch and just need a little clarification. Other than that though, I’m loving how the hat is turning out! Thank you! The turning in the video is because I’m working back and forth in rows. This hat, like most hats, is worked in rounds, where you join at the end, so you don’t turn unless the pattern says to. 🙂 No turning in this one! I’m glad you’re enjoying it! Ok that makes sense, thank you! Thank you for replying so quickly too! I’m making this hat for my niece (and the matching fingerless gloves), and I looked at a few other patterns before coming across this one. I always read the comments to get a feel for how accurate the instructions were, and whether the majority of the people commenting had success or difficulty with the pattern. I was surprised by how many questions went unanswered, and no matter how much I liked the look of the hat, if it was obvious that people were having problems or asking questions that were not being answered, I wouldn’t even attempt the pattern (especially since I’m a beginner). When I saw this hat, I loved it immediately, and was thrilled to see that you answer questions and so promptly too. Had that not been the case, I wouldn’t have even attempted this hat at this stage. So thanks again! Oh and once I’m finished with this hat, I will be exploring your many other patterns as well! 🙂 I’m so glad it helped Nicole! Thank you! I made this hat. I am a beginner. Thanks for such great instructions. It turned out really good. !!!! I’m so glad to hear it! Thank you Jan! Planning to make this patter very soon but I was wondering if you have any suggestions to incorporate 2 colours into the pattern? I have two colours that I’ve been wanting to use together. Hi Sarah! 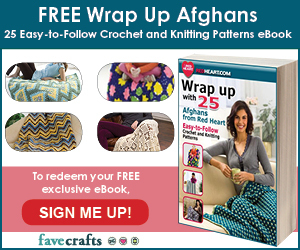 This pattern starts with FDC – foundation double crochet. These stitches take the place of traditional ch and dc sts to create a first row that is extra stretchy and elastic. If you click on FDC in the first round of instructions, where it’s in a different color, that is a link to the tutorial. 🙂 And yes, you make 54 of them! Fingerless Gloves seront-ils traduit en français ? J’ai le Ups and Downs Crochet Slouchy Beanie et j’aimerais bien faire les fingerless. Non, I have not had a translator offer to do those. Merci, je vais essayer quand même avec traducteur. Ils sont très beaux. This hat is amazing! I’ve made five already. 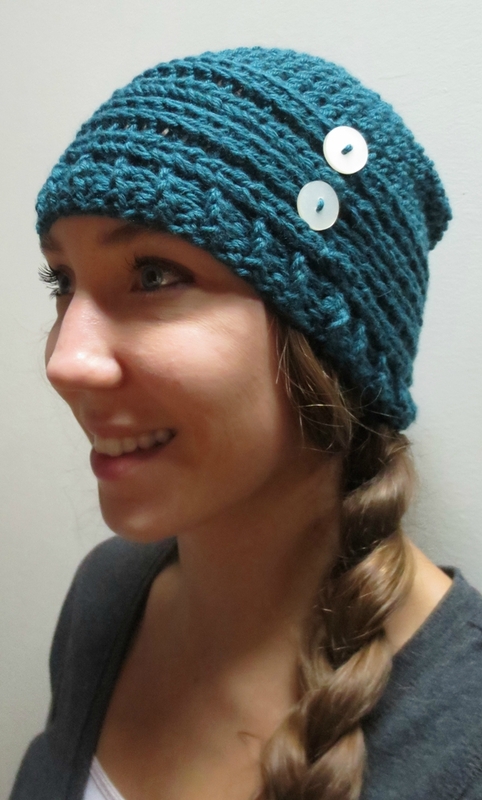 The button idea gives each hat a new look and you can mix colors in any way imaginable! Love it! ? 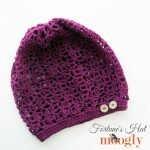 As I did making this hat…my daughter and G daughter will LOVE it. Hi – loving this pattern and you write it out really well to understand – only thing i was hoping for help with is that i’ve done 68 stitches in the large pattern to make it fit, so when i get to row 16 and start the decreasing, the numbers are a bit off – any advice? Hi, I love you page and your patterns…. I want to make this for children toddler and babies is there any suggestion for adjustment to make them smaller? I just finished this hat and I LOVE IT!!!! I’m going to make several to give to the Chemo lab in our area. Thank you!!! 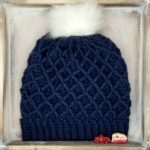 This is the MOST FUN hat to make, and is adorable!! I am addicted to making it!!! The pattern is beautifully written, which is a really big deal to me because I had a brain injury 11 years ago and just learning again to read patterns. AND this one has been one of the BEST!!! Even making a version of it for my 2-1/2 month old granddaughter so mommy & both daughters will have matching hats! I DO want to know – if you don’t mind – where did you get those buttons??? I grew up in the country myself – although not that far out – and I know the fun of hitting the shops when you’re in “town”! 🙂 Have fun! Just wanted you to know that I made your mitts and this hat and then decided to see if I could make a headband. I did and love it! I used the first part of the hat and then added fpdc and the bpdc rows to end it. I was wearing it today and got a compliment. When I told her that I made them, she was so excited. Wanted me to make one for her but thinner. I just finished it and it turned out great. If I could add a picture I would. 🙂 Thank you so much for such an easy to follow pattern. That’s fantastic! 😀 Thank you Susan! Thanks loads. I just made this hat twice in two days and I really love it. 😀 Thank you, I’m so glad to hear it! Thank you so much!!!! I have made so many of these hats, they are a delight to make. And versatile!!! Ups and Downs is my go to beanie!! You are awesomely talented and thank you for sharing it all with us. Love, LOVE this pattern! And thank you for including links to all of the instructional videos. 😀 I’m so glad to hear it! Thank you Amanda! This is one of my favorite go to patterns. I’ve made many of your items. Thank you for your creativity ! 😀 Thank you so much Barbara! 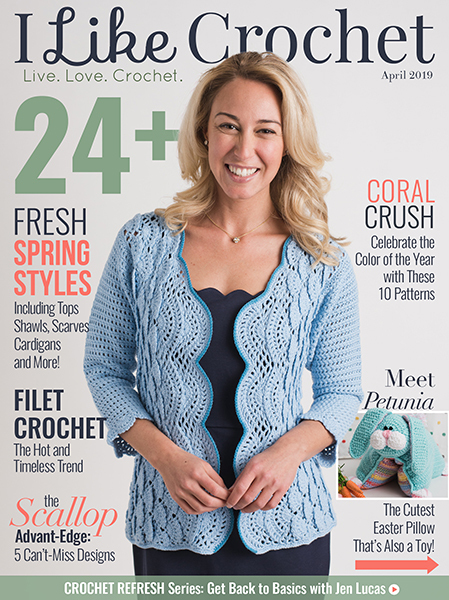 Tamara, This crochet pattern is simple, elegant and ingenious. Thank you for sharing. 😀 Thank you so much Ame! 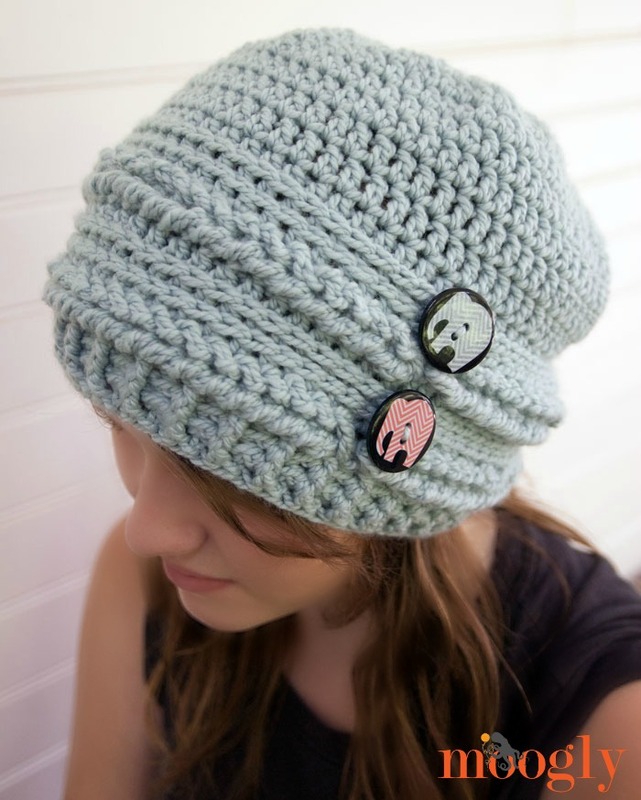 I love this hat but i need the abreviation for the stitches i am new at crocheting if you could please send the Abrevs to my email i would apprecate it very much. P.S. Please put in the subject Crocheting Abrevs. I love the look of this hat and I’m lucky enough to have this yarn, excited to get started. Just a side note, your daughter is a beautiful young lady. Thank you so much!! 😀 I think so too! Would it work to use Wool-Ease thick & quick yarn for this pattern? Hello Paula! I’m afraid that yarn is 2 sizes too big for this pattern as written. I love this! I made it a few years ago, but couldn’t use it too much because I lived in a relatively warm place. I’ve now moved to a colder country, and realized that I didn’t bring it with me. Despite not knowing the language, I’m searching high and low for yarn to make this again! Thank you! I’m starting this pattern and I don’t understand how you connect the first row of fdc with just a slip stitch. Can anyone clarify my confusion? Okay, it’s totally optional! 🙂 I hope you enjoy making the rest of the pattern! I absolutely love this pattern! Thank you so much for making this free! Everyone in my family has gotten one. I get so many compliments. I always tell them where I found the pattern. I have a very large antique button collection and I finally have a way to display them with this pattern. Thanks again! Thank you so much Melissa! That’s so great to hear – and I envy your button collection, I bet it’s amazing! hi! i don’t like making hats from the brim up, so i made a version of this from the top down – is it okay if i post it on my blog and link back to here for the original pattern? thank you! Hi Karen! Did you try opening a second tab to PrintFriendly.com and doing it right on their site? If that doesn’t work, there’s also the CleanPrint extension for Chrome. 😀 Thank you so much Vera! I don’t know if I was the first to think of doing it that way, but I’m so glad people enjoy it!